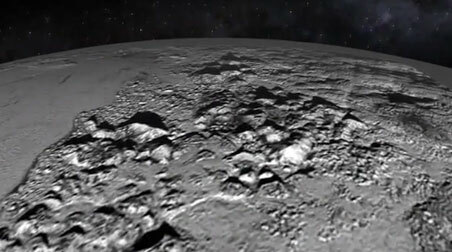 Pluto Has 2-Mile-High Ice Mountains, Plains of “Bubbling” Ice and “Wind Swept” Smudges. Weather? Heating Convection? “Who would have supposed that there were ice mountains? July 18, 2015 - NASA's Friday, July 17, 2015, press conference about Pluto showed videos from the New Horizons close fly by on July 14th. Greater than the first images of 11,000-feet-high mountains, the spacecraft also flew over what scientists call the Norgay Montes ice mountains in which there are some solid ice peaks two miles high!New Horizons Project Scientist, Hal Weaver, Ph.D., from Johns Hopkins University Applied Physics Laboratory, said, "Who would have supposed that there were ice mountains? It's just blowing my mind!" NASA's New Horizons spacecraft flying about 7,700 miles above the Norgay Montes ice mountains of Pluto where some peaks are two miles high! Video released by NASA on Friday, July 17, 2015. See: NASA flyover video.